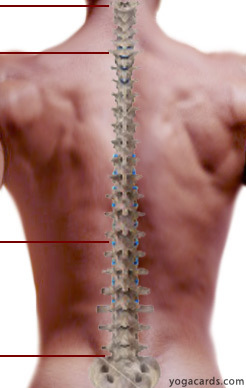 Scoliosis is a lateral curvature of the spine. The lateral curves of scoliosis are accompanied by rotation since the spine cannot bend laterally without also rotating. Scoliosis can be improved with yoga back exercises and alignment awareness. We try to improve the condition with postural awareness and yoga postures. Scoliosis can be congenital with disease or acquired through injury. Muscles imbalance, unevenness of the leg length or changes in the bone structure of a vertebrae. If the cause of scoliosis is not identified it is known as idiopathic scoliosis. Scoliosis can cause the spine to curve like a C or an S. C-curves can also turn into an S-curve due to muscles compensating. When muscle weakness causes scoliosis opposing muscles quite often cause further harm by contracting. Tests are done during motion so that the muscle imbalanced can be identified. One motion test is to observe the spine when an individual bends forward from standing and then returns to standing. Because muscle imbalance, which can occur without reason, is always present in all forms of scoliosis yoga exercises that stretch certain muscles and strengthen others will greatly improve proper posture and reduce pain resulting in reduced symptoms. Research has shown that exercises that promote too much flexibility had a negative effect on the curvature of the spine in many cases making it more prone to collapse and instability. Therefore choose more exercises that strengthen the spine and lightly stretch it when formulating yoga exercise for scoliosis. In the early 1900’s many young people with scoliosis were sent to gymnasiums for exercise. After careful monitoring for a decade it was found that there was an increase in the curvatures of participants. At first one would think these exercises would be good but so the results are quite surprising. If an expert in muscle imbalance and exercise can be found they will be able to identify the muscles pulling the spine further out and the muscles causing pain saving you expensive diagnosis with hi-tech devices. The muscles that are acting on the spine in a negative way should be stretched and the muscles involved in stabilizing the spine should be strengthened. Research has shown that exercises that promote too much flexibility had a negative effect on the curvature of the spine in many cases making it more prone to collapse and instability. Therefore choose more exercises that strengthen the spine and choose light stretches when formulating yoga exercise for scoliosis. Scoliosis can quite often be identified by viewing someone in a seated forward bend. It does not have to be as deep as the one shown and a mild stretch is preferable. The view shown is diagonal but this test is viewed sideways on each side. When this forward bend is viewed sideways from both sides one shoulder seems raised due to the bones in the spine. 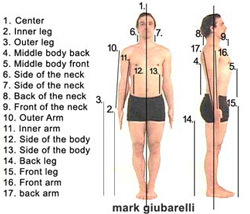 Tadasana is a pose that has many areas that can be measured. When a scoliosis sufferer is in any pose both sides of the torso should be even. Look for one side shortening and try to correct it. For instance areas 12 and 13 shown opposite will be uneven in most poses. Yoga for back pain should begin with simple stretches for the lower back then yoga exercises that strengthen the back and supporting muscles. Deep standing yoga postures may also stress the joint but done lightly may be beneficial. If a yoga posture feels like it is causing greater pain patterns it should be avoided or at the least modified. Learn how yoga can sometimes cause back pain but can also help to heal back pain. Be sensible. If your attending a yoga class don’t come straight into Upward Facing Dog. Choose a light Cobra pose and protect your back. Do this throughout your practice or at least for the first 5 to 10 Sun Salutations. This is the best way to aid the healing process. Choose an exercise program that is not too intense. Slowly increase the intensity of stretches and strengthening exercises to prevent aggravation in the spine. There may be a little back pain after exercises but don’t be put of. Try again at less intensity. Choosing the right Yoga for back pain will strengthen the spine and increase flexibility. This is necessary for support and greater range of motion. Yoga is important for reducing back pain and improving movement and function, although practitioners often find it difficult to maintain exercises when an injury is aggravated by back exercises. Back exercises are necessary for a healthy spine and can many times remove back pain but proper posture must also be practiced to greatly reduce back pain on daily basis. More yoga back exercises to prevent and help back pain. affect if done incorrectly or too deep.